One year ago today, we boarded a plane and set off to make our dream of traveling around the world a reality. We are happy to report that we are still alive and well. Today we are wondering, how did this year go by so quickly?! But in all reality, when we revisit the past year in detail, we realize just how much we have experienced. Our ‘Year in Review’ includes two photos from every country we have visited in the past year. One selected by Mike and one selected by Amy. This was an insanely difficult task, since we have over 12,000 photos now! Some photos are memories of a favorite place we visited, while others symbolize our mindset at that point in time, and a few are just pictures that we really love. We hope you enjoy and thanks for reading our ramblings for the past year; there is still more to come! This place is unlike any other church in the world. Our visit to el Templo de la Sagrada Familia took place on the first full day of our journey and really started things off with a bang! 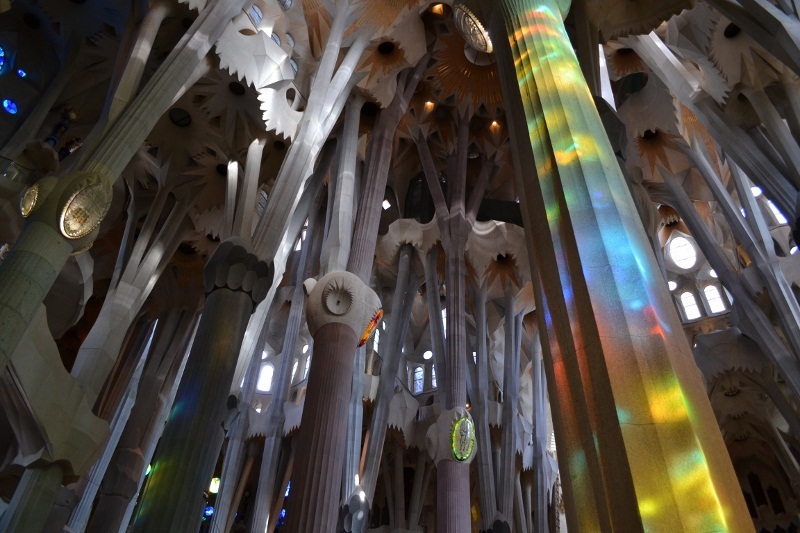 I can’t wait to return to Barcelona to see it again when construction is completed after 2026. When we stepped off the train in Granada, we were shocked with an unexpected bitter cold. 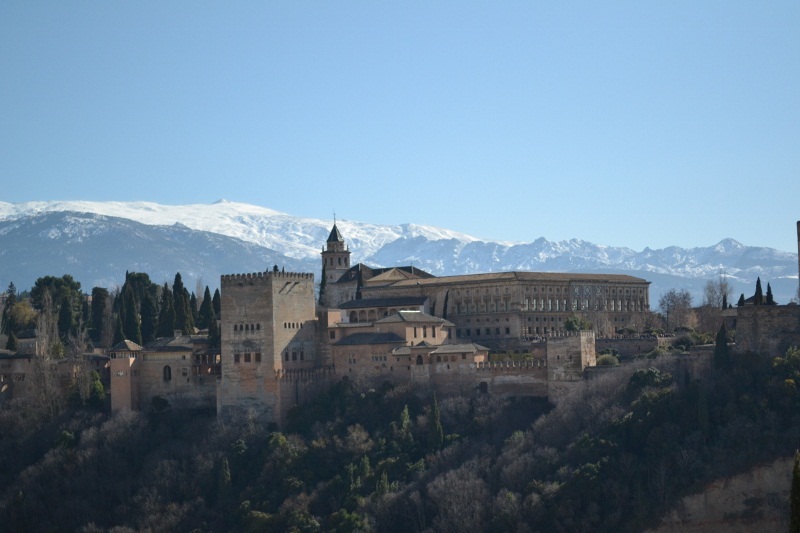 Despite the below freezing temperatures we had an incredible day exploring La Alhambra, one of the most stunning palaces I have ever visited. 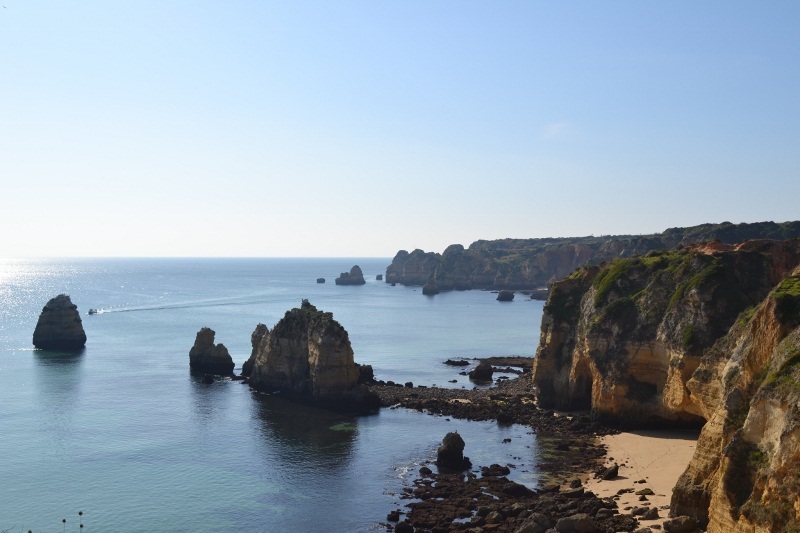 We try not to talk about work too much on our trip, but when you work in hospitality and tourism, a RTW trip is filled with very relevant learning opportunities. 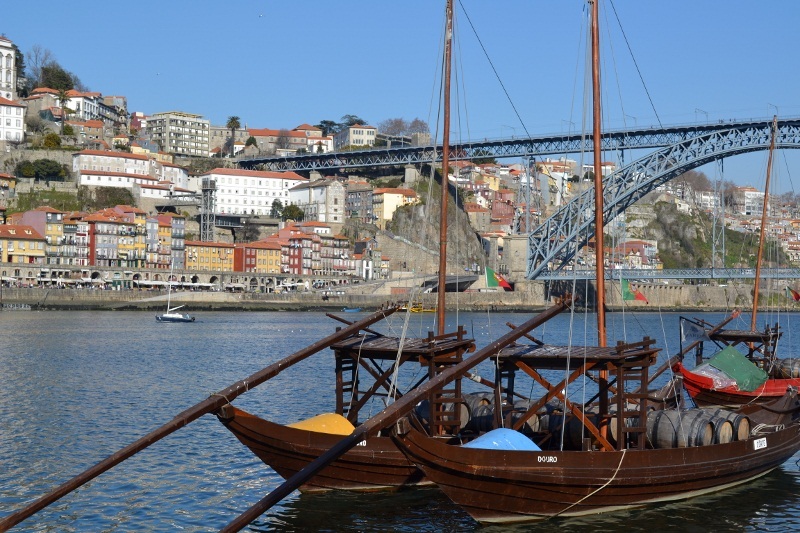 I have an all new appreciation for port wine after visiting several cellars in Vila Nova de Gaia. Lagos was the first of many improvised stops of our trip. To be honest we had never heard of it before, but it was along our bus route from Spain to Lisboa, so we stopped through for a few days. I will always remember Lagos with special sentiment because in my mind it symbolizes spontaneity. 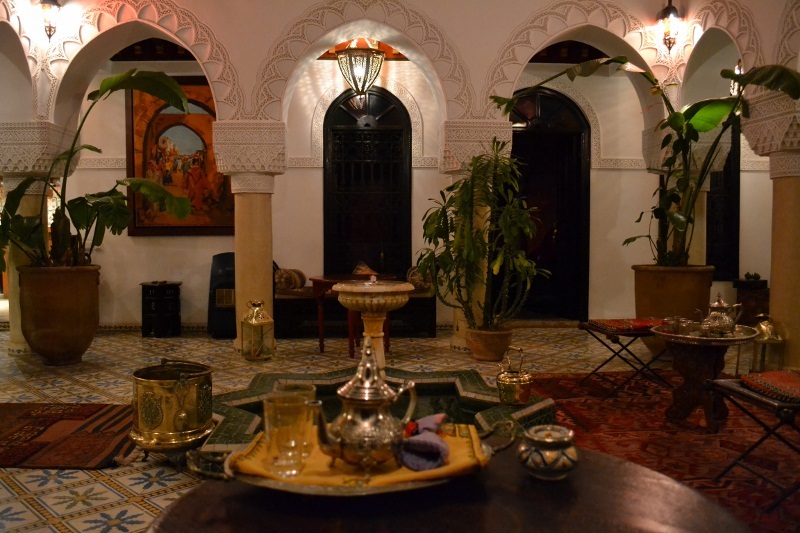 Sipping mint tea in the refuge of our riad was one of the most relaxing experiences of our trip. I loved starting and ending our days sitting right here! 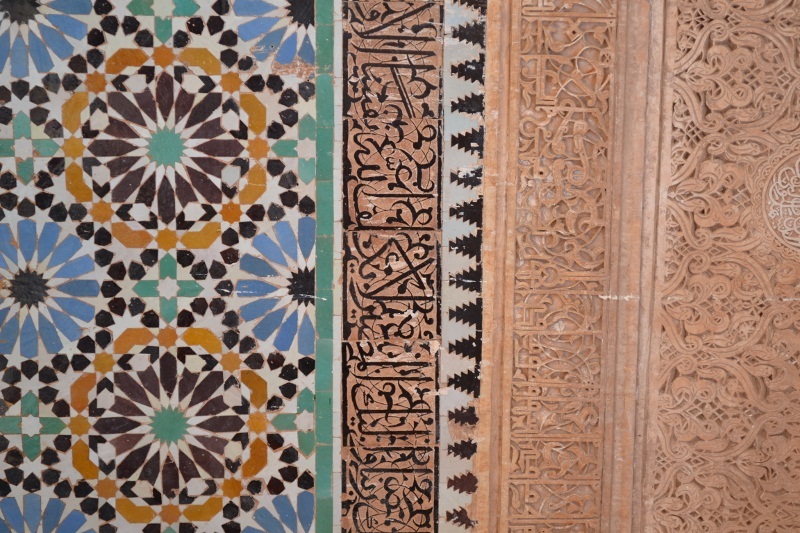 The colorful and intricate tiles in Morocco are unbelievably eye-catching. I would love to use tiles like these to decorate our house someday. Nils (Amy’s host dad from her study abroad experience in 2006) was about as excited for our trip as we were. He and I took many trips “around the world” using these fun shot glasses printed with a world maps. 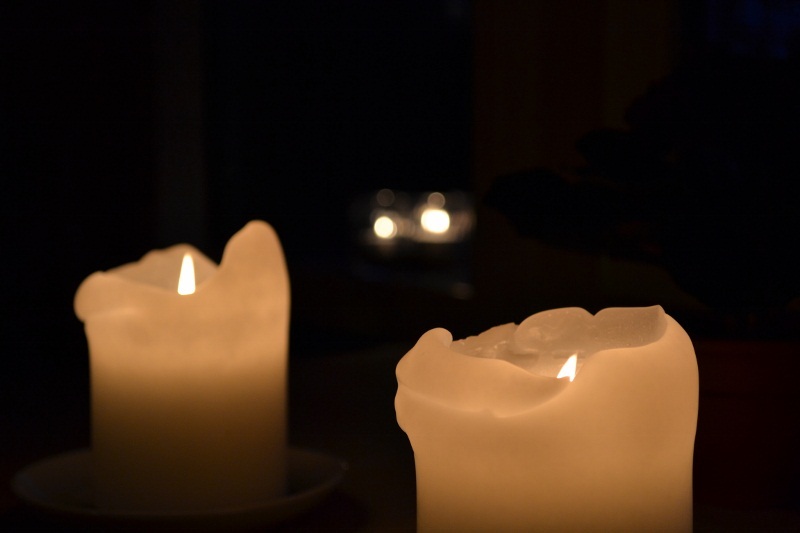 These candles represent Danish hygge to me; it is a difficult word to translate into English, but generally embodies spending quality time with family & friends while being cozy, content and relaxed. There was plenty of hygge to go around during our visit with my host family. During our time in České Budějovice, I had a high fever and terrible case of the flu. 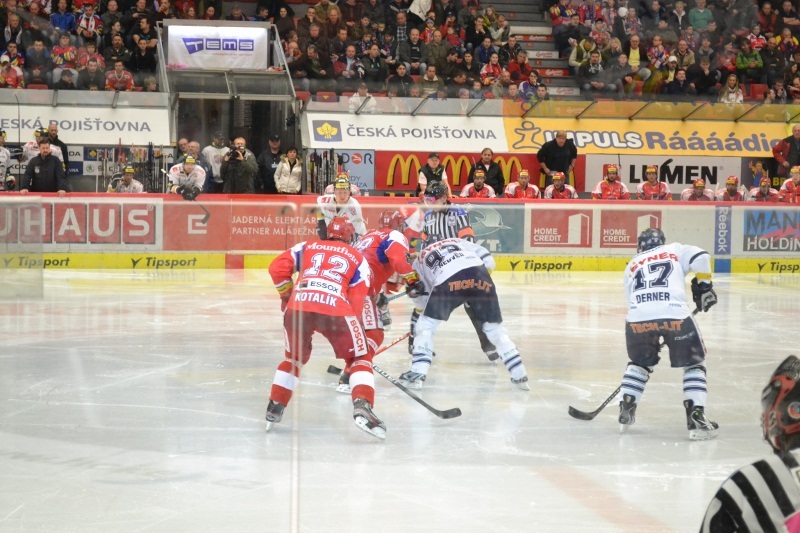 I spent three whole days in bed and even considered going to the hospital, but still but couldn’t pass up the opportunity to see a Czech hockey play-off game. 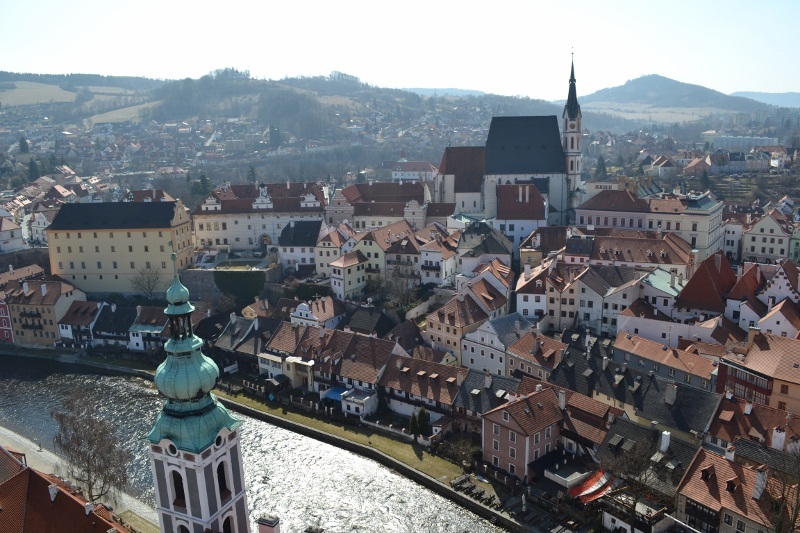 Český Krumlov is one of those magical places that makes you feel like you’re living in a fairytale. I love this photo because it captures the European-style architecture and lazy river that winds through the town. 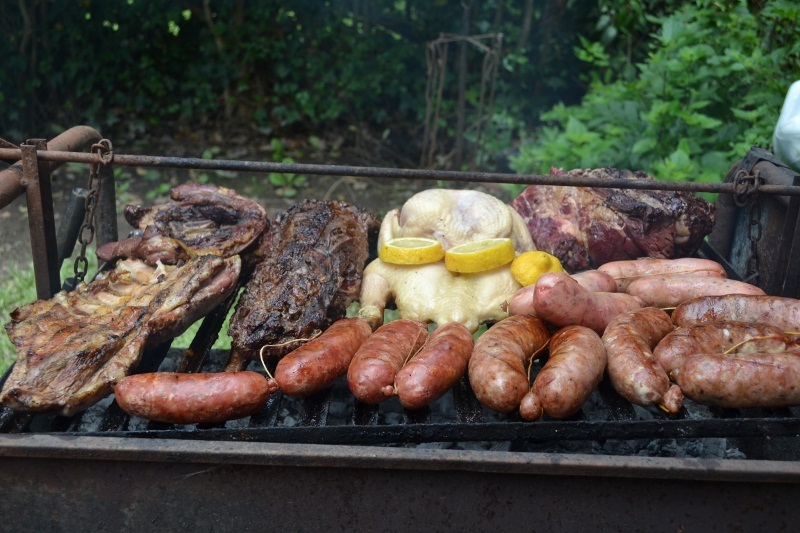 A major theme of our blog over the past year has been food. 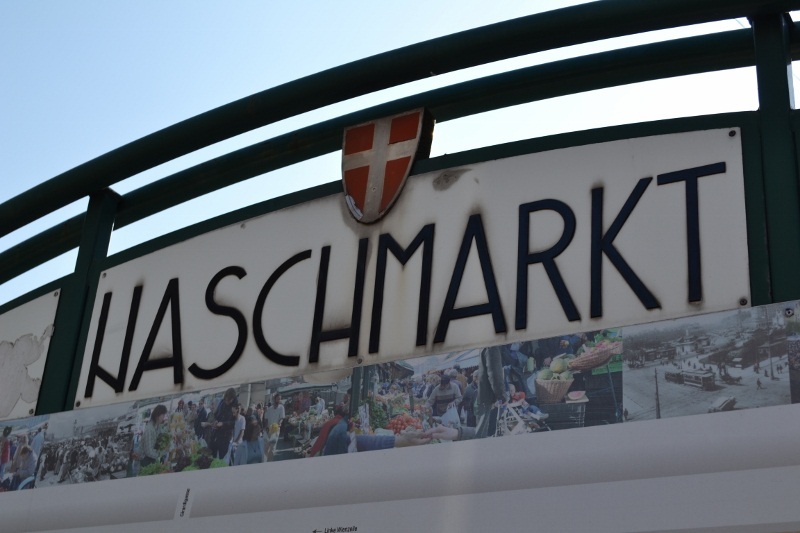 In Vienna, the Naschmarkt is one of the best places to take a stroll, grab a bite, have a beer, and see some really great artisan food and crafts. We were in Vienna for less than 48 hours, but made two trips to the Naschmarkt during our time there. 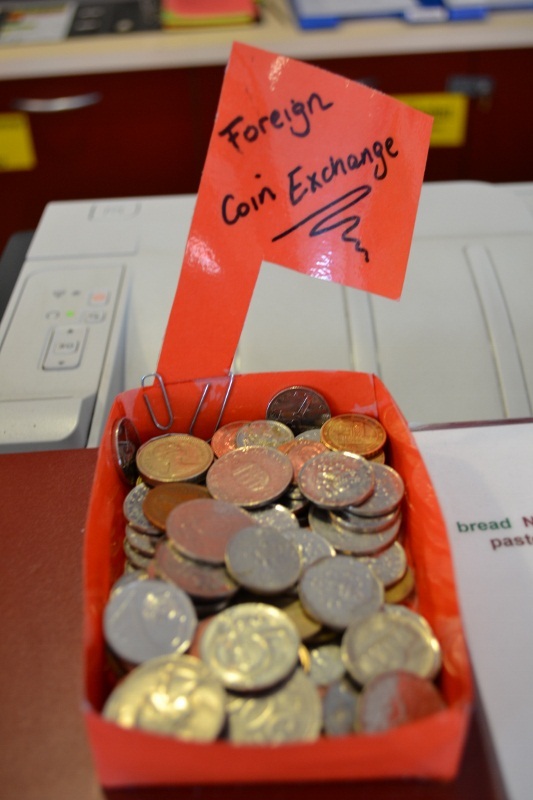 We only spent two days in Austria, using Vienna as a stopover for a train connection, however we found this clever coin exchange at our hostel. This photo reminds me of a game we play – whenever we leave a country, we try to use up all of the bills and coins that we have on hand, whether it be buying a piece of candy at a shop or giving it to a fellow traveler. Whenever I arrive in a new city and hear about hot springs, thermal baths, or the like I get really excited. Who doesn’t like a nice soak? 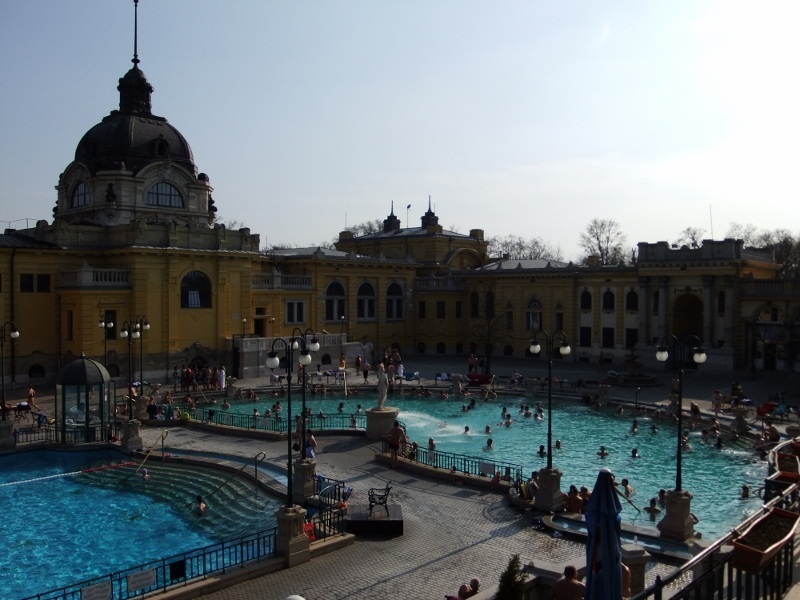 After a few months of backpacking under our belts, a day relaxing in these amazing public baths was just what the doctor ordered. 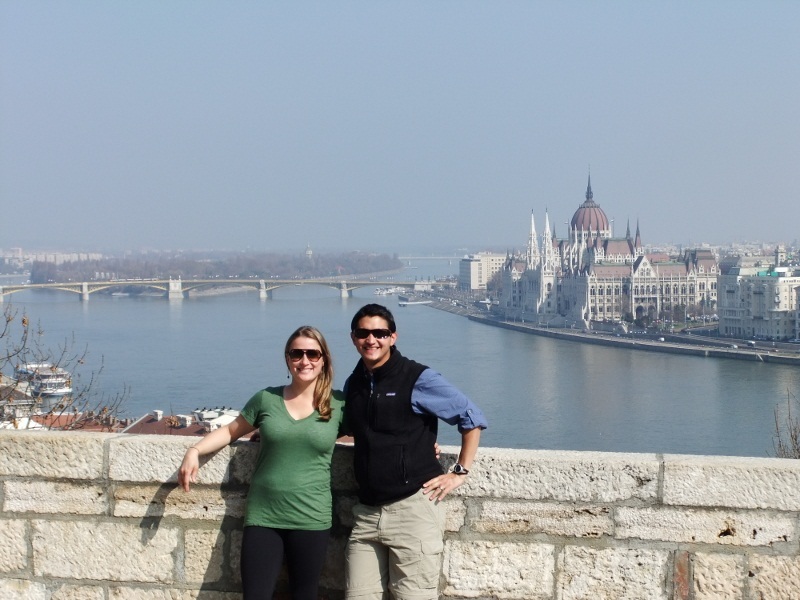 Budapest is one of my favorite European cities. I love how the river splits it into the Buda side and the Pest side. This day we walked almost 14 miles, exploring both sides of the city and growing our appreciation for how massive, yet accessible, it is. 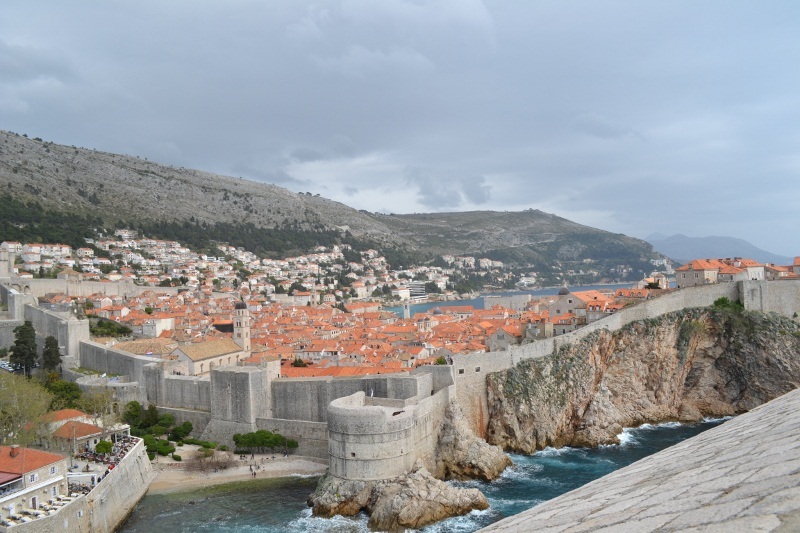 After the Bed Bug fiasco was behind us, we really enjoyed the gorgeous walled city of Dubrovnik. I felt like I had been transported back in time. 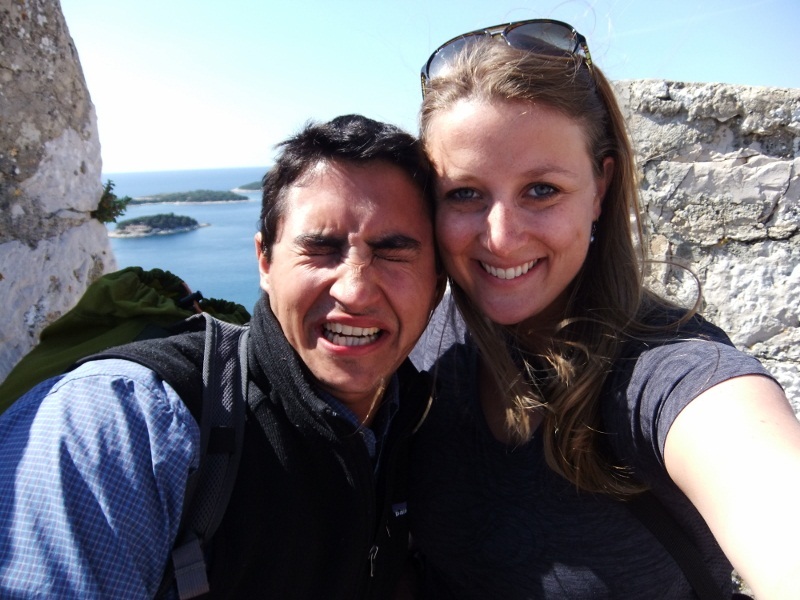 This is my favorite self-photo of our entire trip. Somehow it captured Mike at the split second he was sneezing! When most people think of Bosnia, they think of the war. Few realize what an beautiful place it really is. 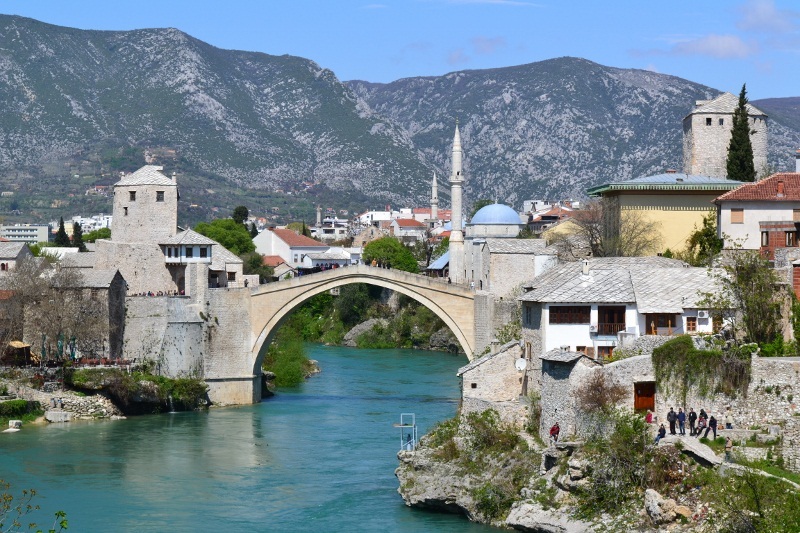 The iconic bridge of Mostar was destroyed by bombs, but it has since been rebuilt and serves as a symbol of a country trying to heal. The Bosnian War is the first war I remember as a child, so visiting Sarajevo was very emotional. 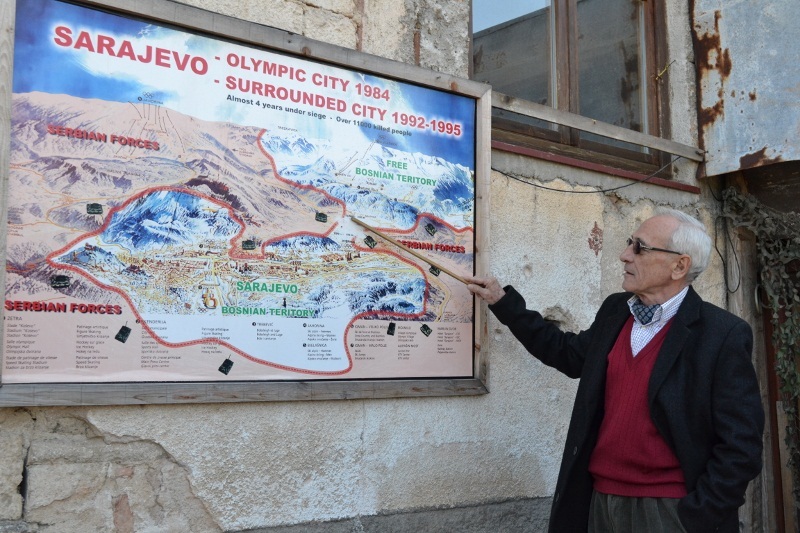 We took a tour with this man who lived through the war, and it was one of the most inspirational and educational things I did in the past year of traveling. 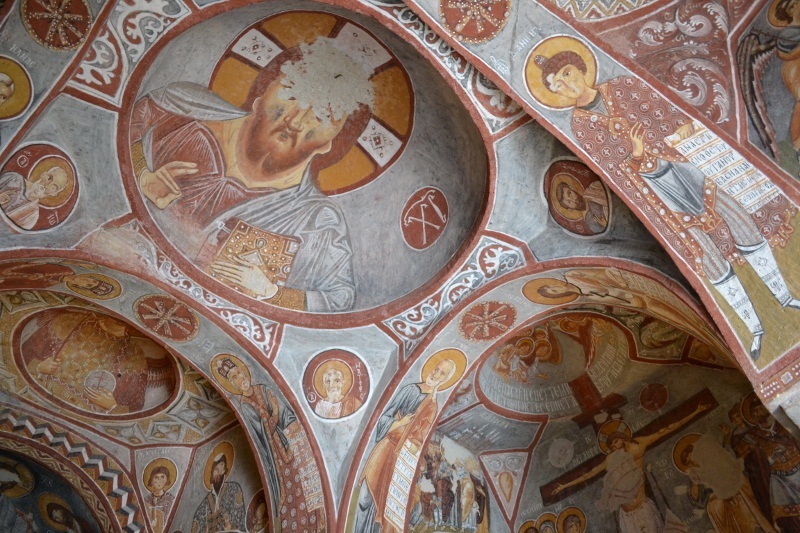 Our first day of exploring in Cappadocia included the Göreme Open Air Museum and its ancient churches and dwellings. Built by early Christians fleeing persecution, it is arguably the “birthplace” of the entire religion. Visiting was a very spiritual experience for me. The mosques of Istanbul are a sight to behold. 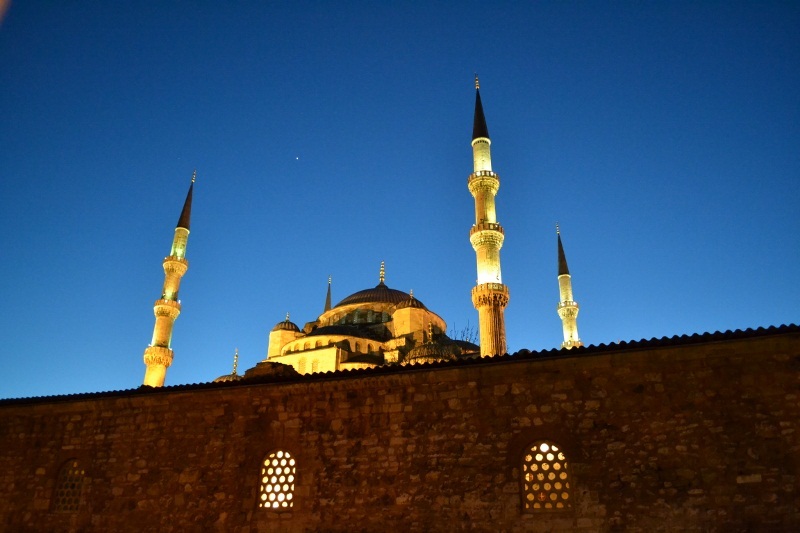 Spending a few weeks in Istanbul taught me so much about Islam. Visiting Istanbul helped me to understand that it is possible for traditionalists, modernists, and everyone in between to coexist without surrendering their cultural identity. For me, one of the coolest parts of traveling is snacking my way through a city. 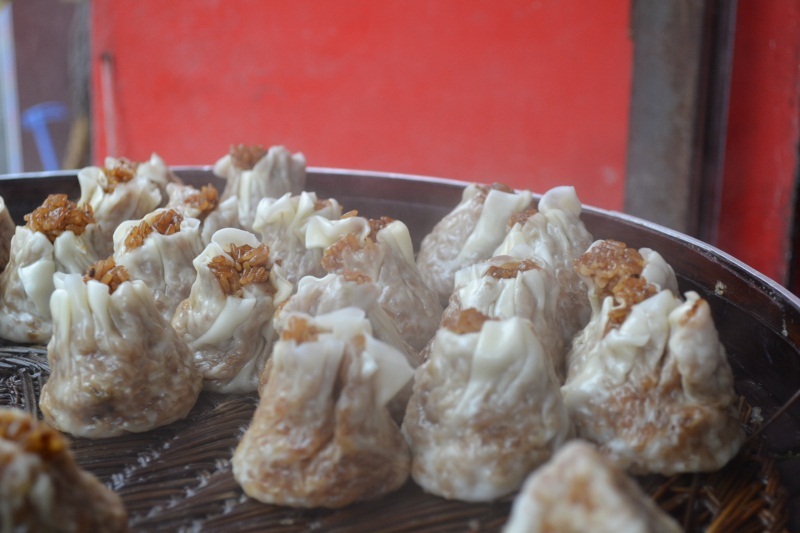 We ate these rice dumplings almost every morning in Shanghai. Some cities in the US have food carts/trucks, but nothing quite compares to the street food scene in Asia. Forget what the State Department tells you; my advice, when you travel abroad EAT STREET FOOD!!! 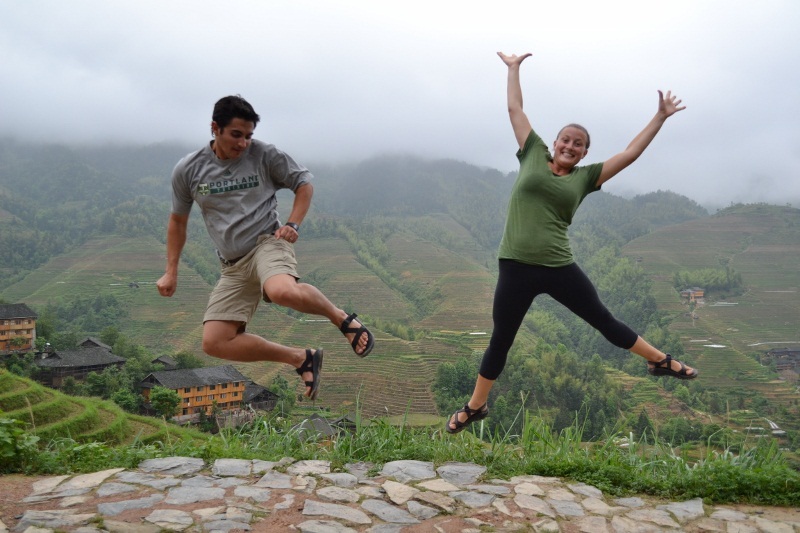 In the midst of China’s traffic jams, overpopulation, pollution, and noise, the rice terraces of Dazhai were the perfect escape for a few days of peace. I love this picture because we spent nearly an hour getting this shot with both of us in the air. It may seem like a concrete jungle, but Hong Kong actually has some really great hikes, beaches, and islands. 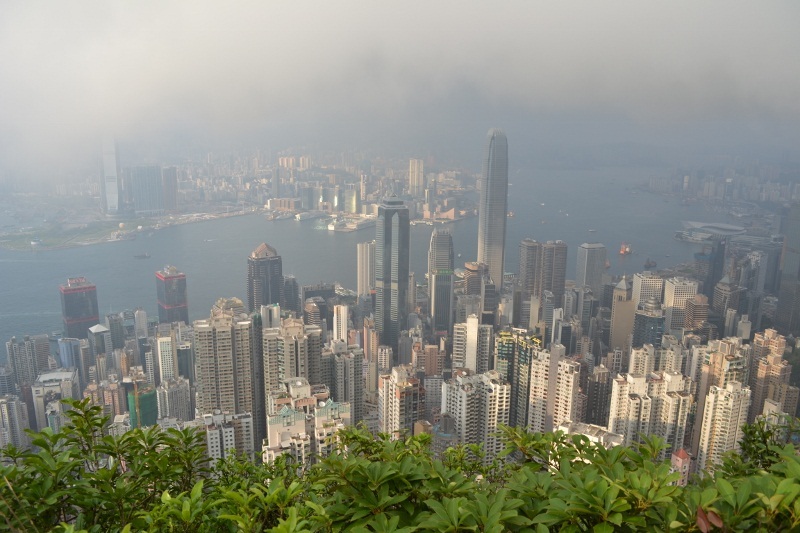 I really enjoyed our hike around Victoria Peak which ended with this panoramic view of the city. The stark contrast between landscapes in Hong Kong surprised me: a mega city that also has remote wilderness islands. 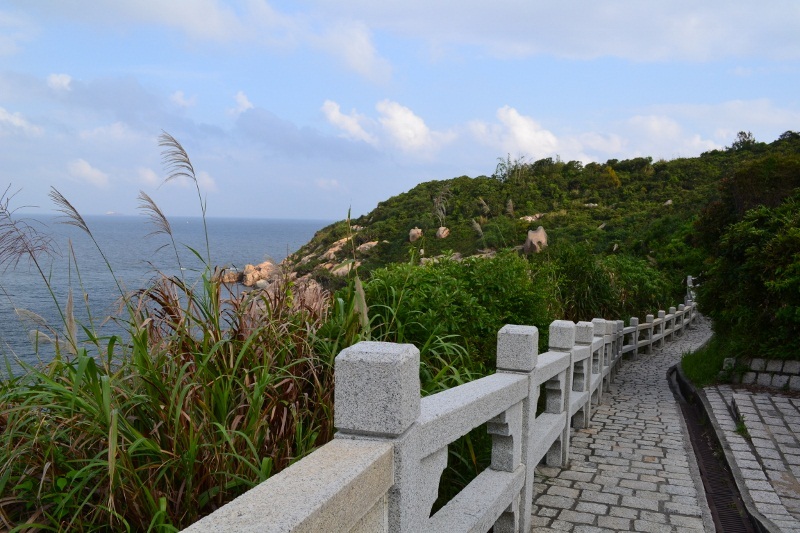 We spent the day at the beach and hiking the perimeter of Cheung Chau island. 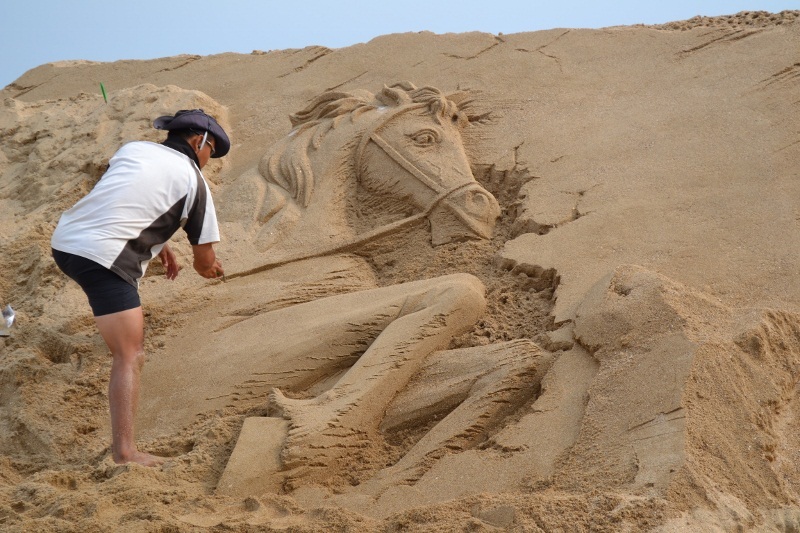 There aren’t a lot of beaches in Colorado; so it’s not big surprise that I had never seen sand art like this before. These artists are ridiculously good. We had a hard time fitting this sushi dinner into one photograph! 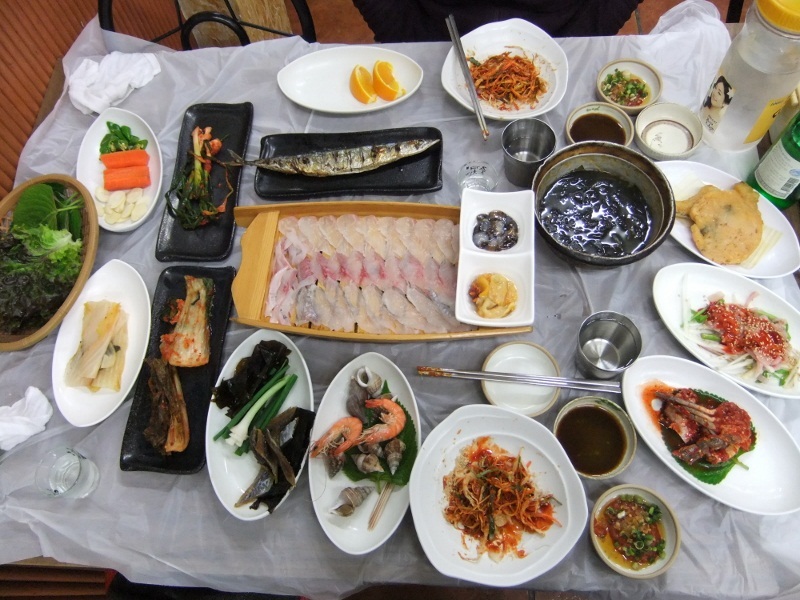 It included everything from raw sea squirt to mud eel. 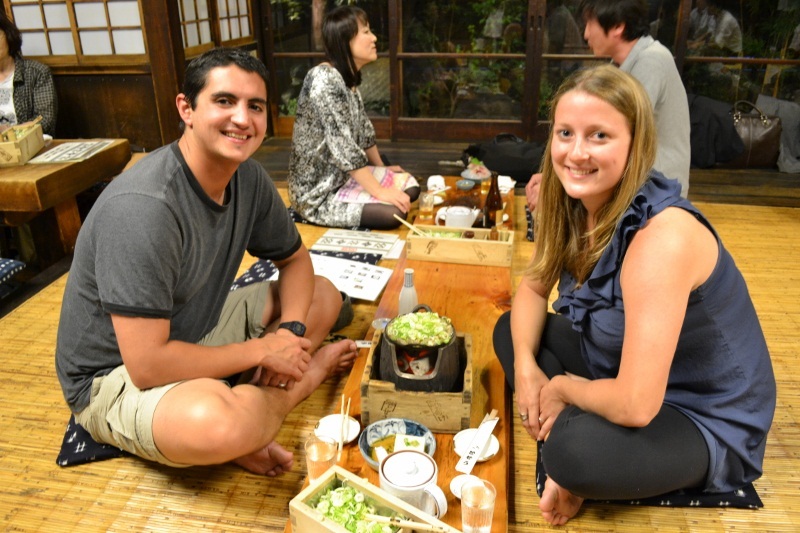 Even though we shared no common language with the couple sitting next to us, they walked us through each dish and how to eat it properly. When we sat down and ordered, we had no idea what we were about to eat. We just got what everyone else was having. I like this picture because it reminds me of how the cooks complimented us on our chopstick skills and Japanese table manners. I love this photo because of the sheer color! 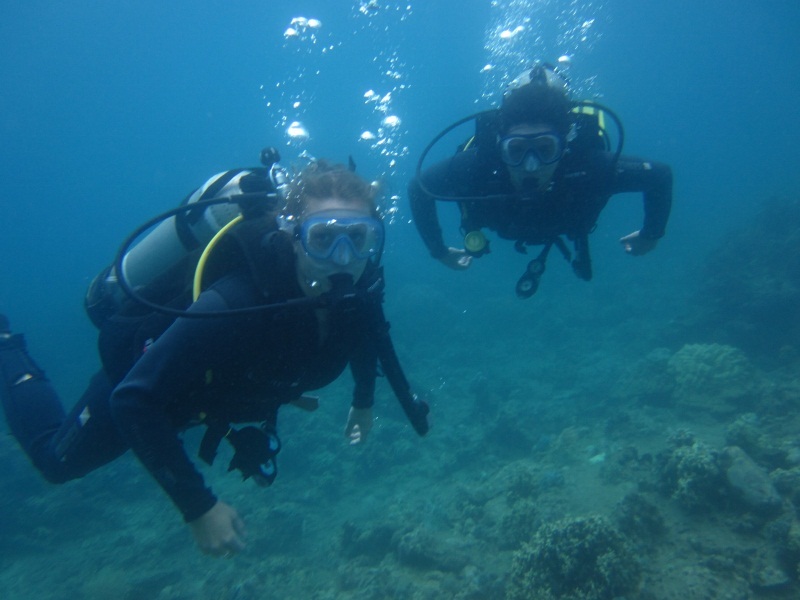 SCUBA diving is one of the coolest things I have ever learned to do. This was our very first day of diving – we didn’t have the hang of buoyancy yet, so the fact that our dive master captured this photo was something of a miracle. What can I say about Angkor Wat? This place is just sooooo cool. Cambodia may not have delicious food like Vietnam or dreamy beaches like Thailand, but Angkor Wat is more than a good enough reason to visit. I love this picture because it allows you to actually see the thousands of years of history that has taken place at Angkor Wat. The sheer size of this tree’s roots growing into the temple walls helps you to appreciate its place in the past and present. 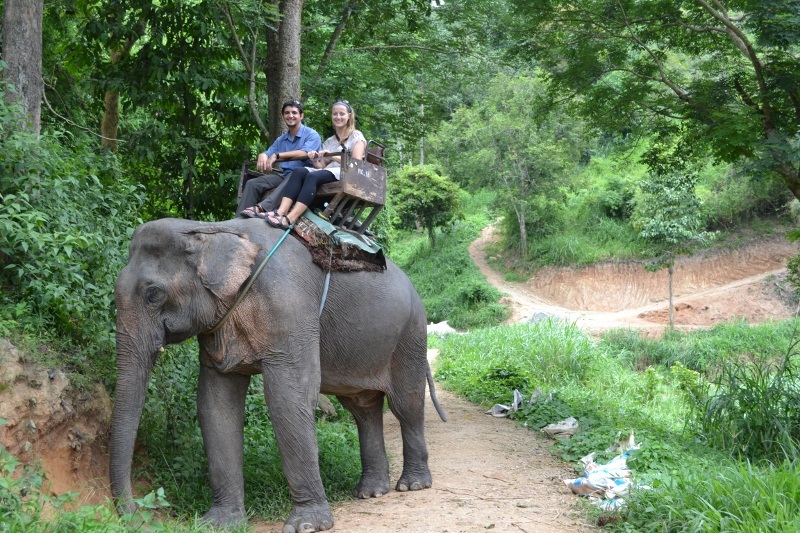 We spent a lot of quality time with animals in Thailand: riding on elephants – cuddling with tigers – fending off monkeys. 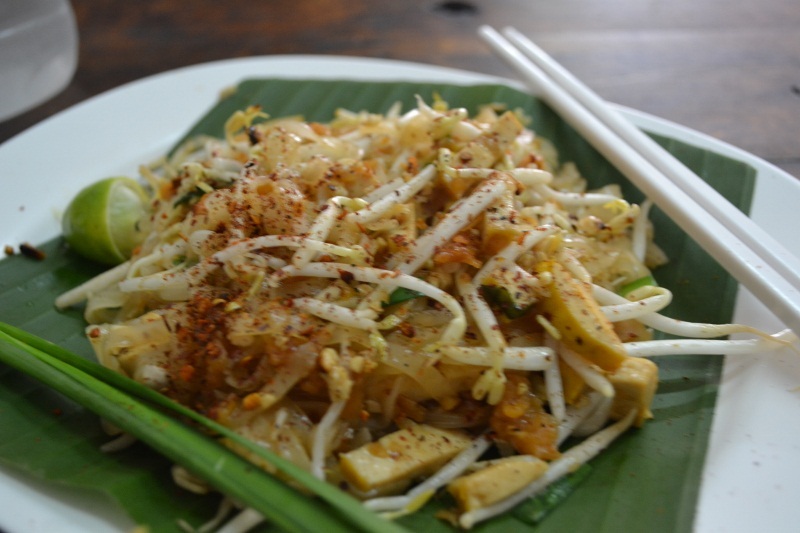 Pad Thai with tofu is my absolute favorite Thai dish and I miss eating it every day for breakfast! Surprisingly, considering all of the times we ate it, I can’t believe this is the only photo we took. 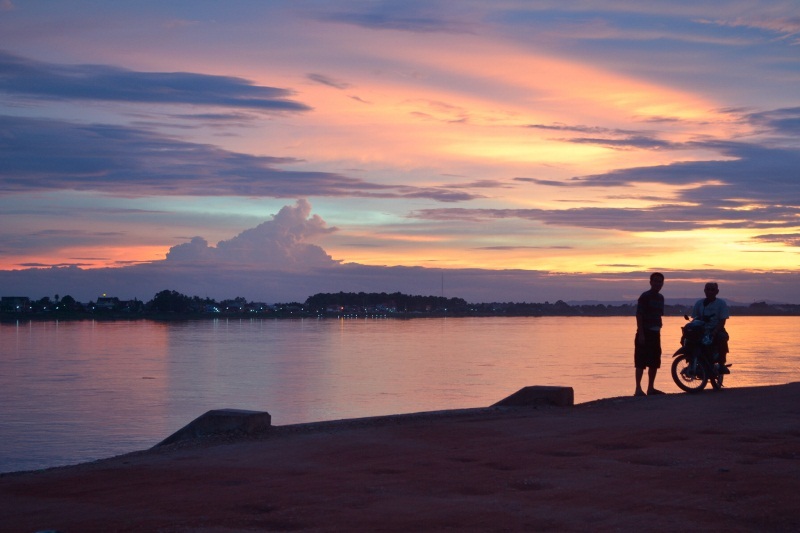 This amazing sunset over the Mekong in Vientiane was one of my favorite from the entire year. You wouldn’t know it from this picture, but it seemed like the entire city came out to the river that evening to watch the sun slowly disappear. After the most horrifying bus ride ever from Vang Vieng to Luang Prabang, we decided to fly back to Vientiane instead of enduring another death-trap bus. 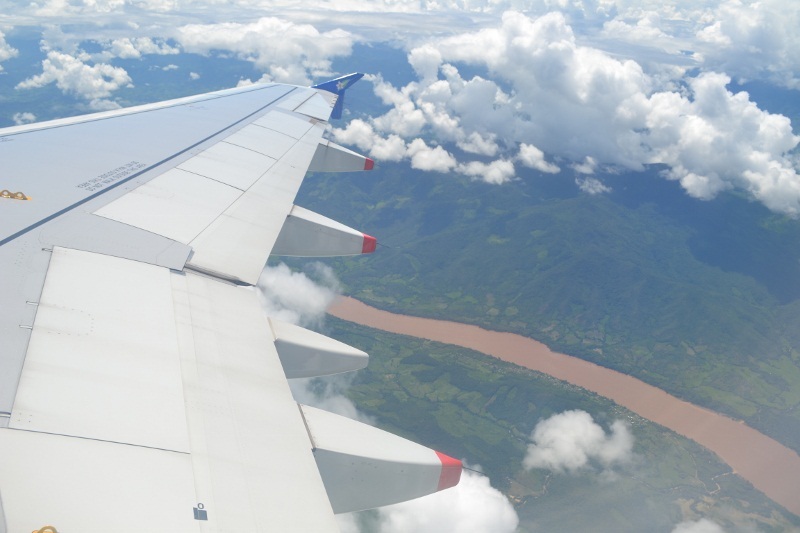 This was the most beautiful flight of my entire life – the mud brown Mekong twisting through deep green jungle. It may be a small country, but I was really impressed by Singapore’s modern architecture. The truth is that Mike stole the photo I wanted to choose for Singapore, so I picked this one instead. 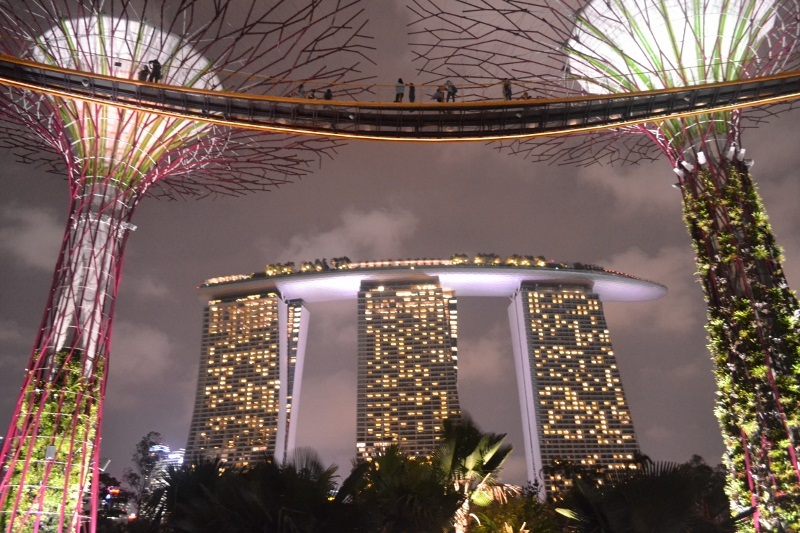 This photo is of the ground of a DNA helix-shaped bridge in Singapore. My nerdy science-loving side really loved this bridge:-) The A and the T represent the nucleotides adenine and thymine. SCUBA diving and beach-time pretty much sum up our month in Malaysia. 15 tanks each in less than 30 days. In retrospect, I think we should have stayed longer. This is a place where two days turned into four, and four into six, and six days into two weeks. 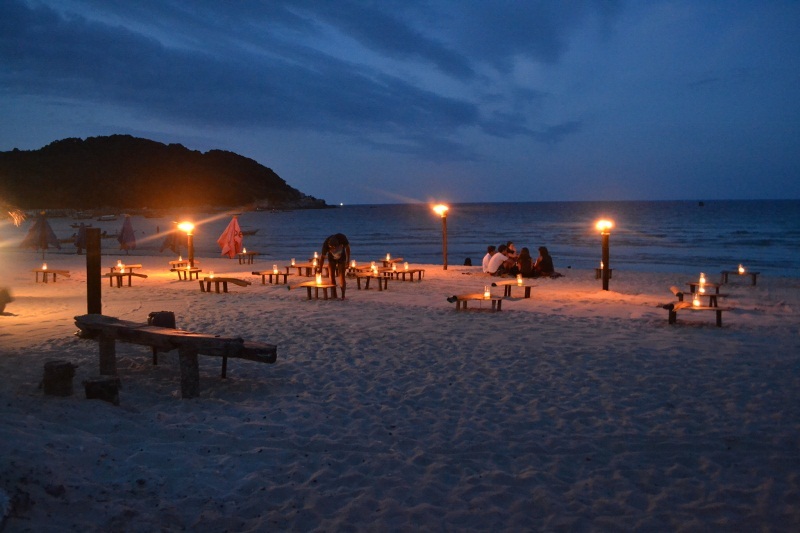 I loved living on the beach, relaxing, diving and having a blank mind. 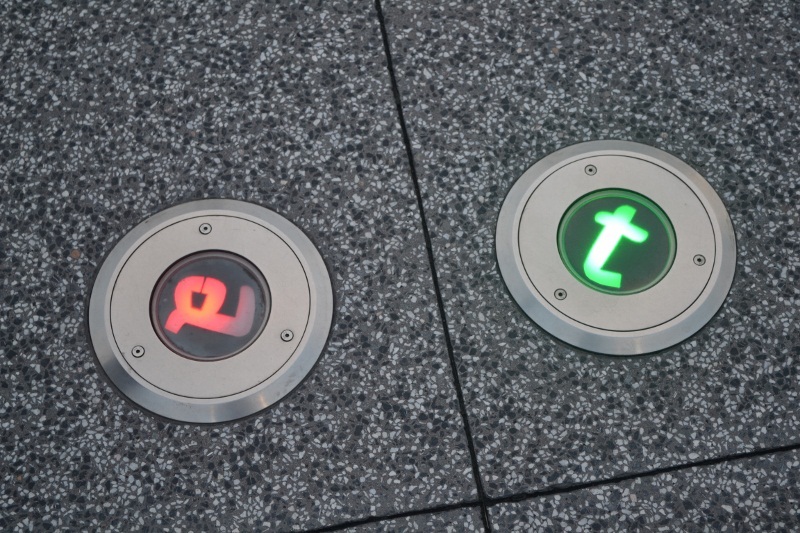 If you’ve been reading our blog since the beginning, then you may recognize our friends here. It was our first time in Australia, but they really made us feel at home. Juan wasn’t very pleased with the fishing that week, but the Coral Trout I caught is enough to keep me enthusiastic about giving it another go. 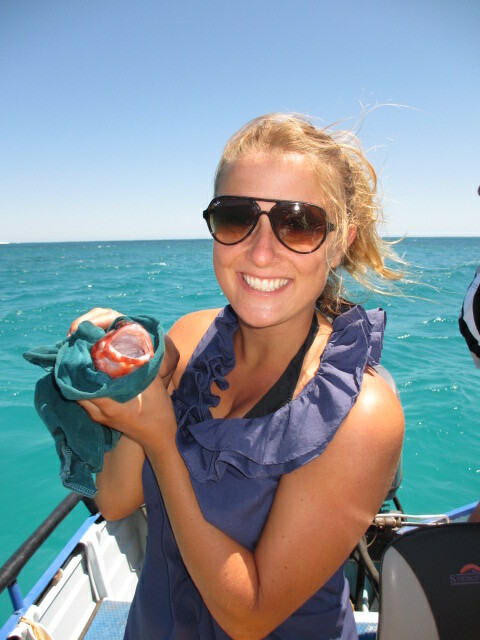 A memory of the first fish I ever caught in the open water! We almost left Kaikoiura the day before this picture was taken. I am glad that we decided to stay another night, because we would have missed out on a great hike and some unforgettable views. 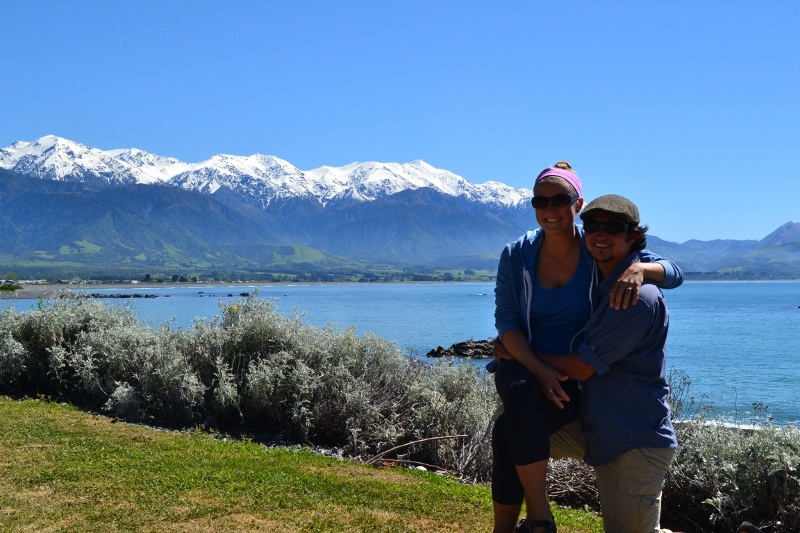 This is only one of the hundreds of beautiful scenic photos from our month in New Zealand. 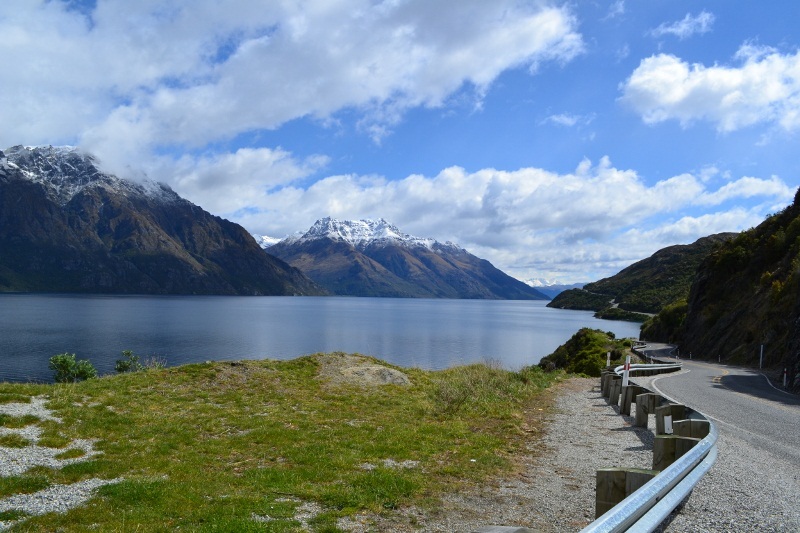 This road into Queenstown from the south is one of the most spectacular drives I have ever taken. The water in this lake was so salty that it felt thick when I walked through it. 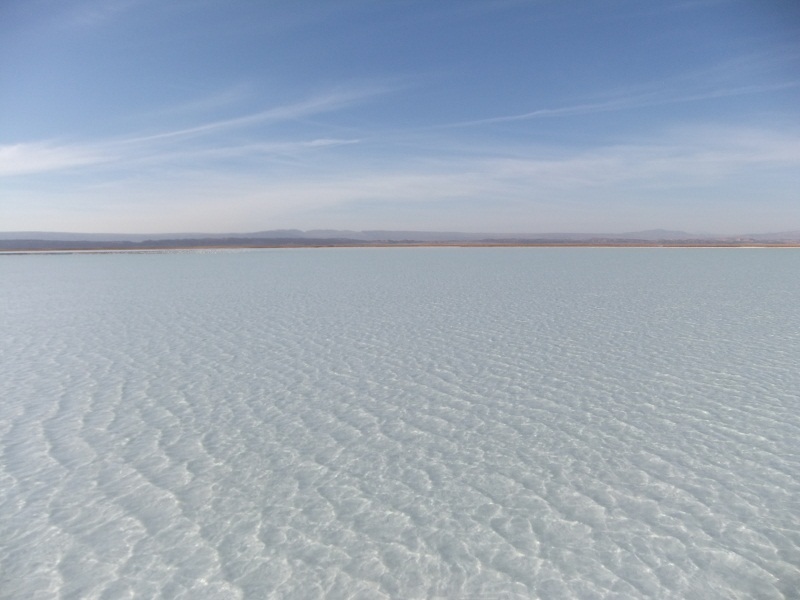 The natural wonders of San Pedro de Atacama left me in awe day after day. 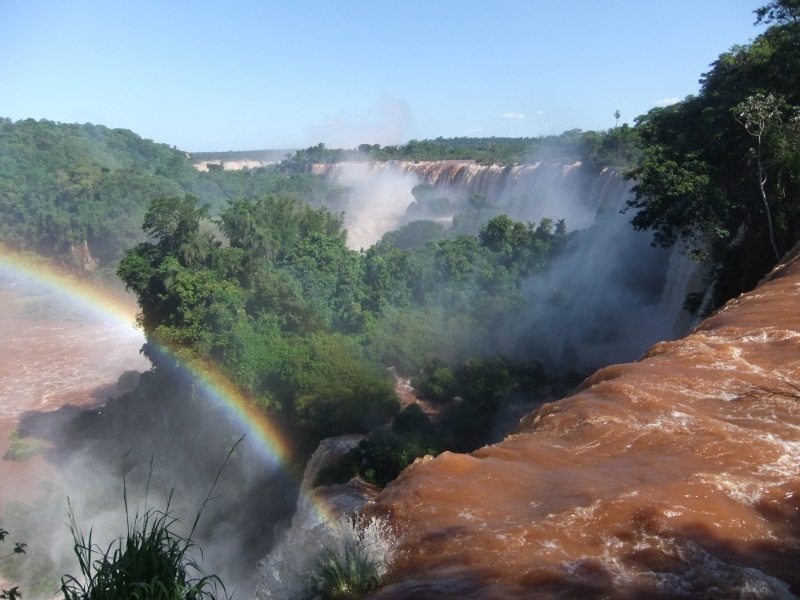 During our second day visiting Iguazu Falls, we were graced with perfectly blue skies and a rainbow across the falls! 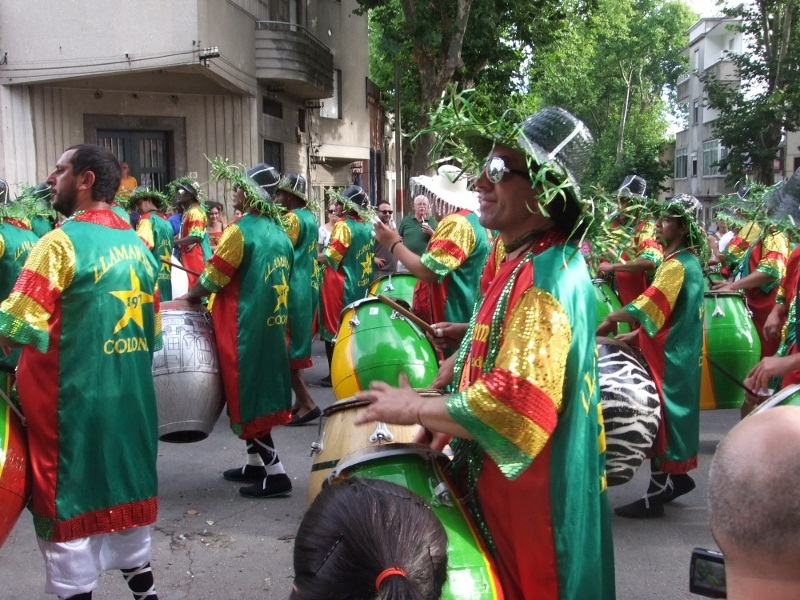 Hopefully this was just a small taste of things to come during Carnaval in Cartagena. 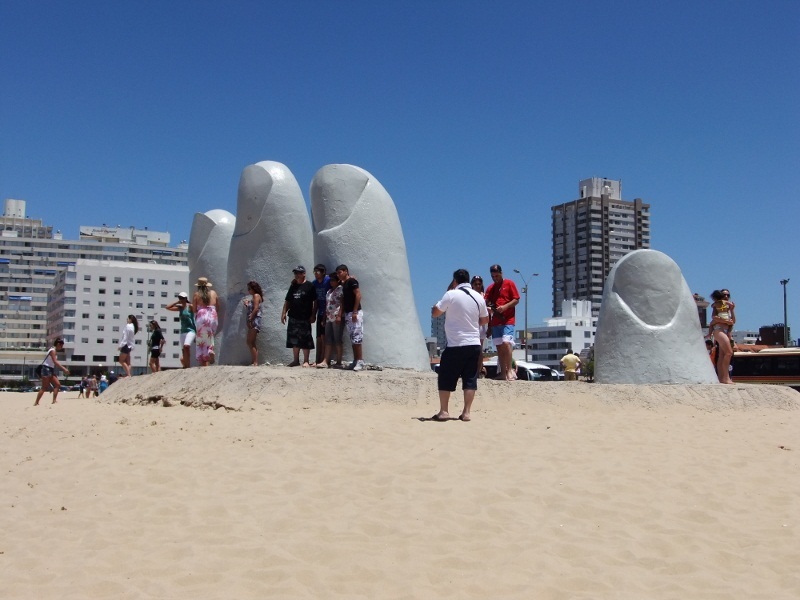 This sculpture is just plain fun. It makes you feel like there is a giant living underneath the sand, waiting to grab you off your towel while you’re sunbathing. 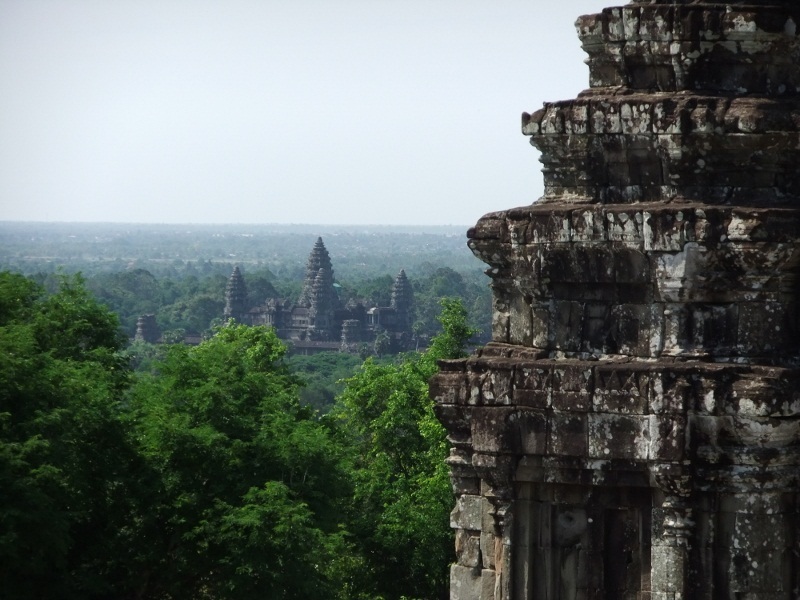 What’s Up with Angkor Wat? Our favorite view of Angkor Wat from Phnom Bakheng, the famous hill from which sunset and sunrise are watched by tourists each day. While this temple complex bears the name of its most famous structure, Angkor Wat, it actually contains over 1,000 temple ruins which were the center of the Khmer Empire. It is an awesome place (truly “awe” inspiring, as the word was intended) that all travel lovers should add to their bucket list. 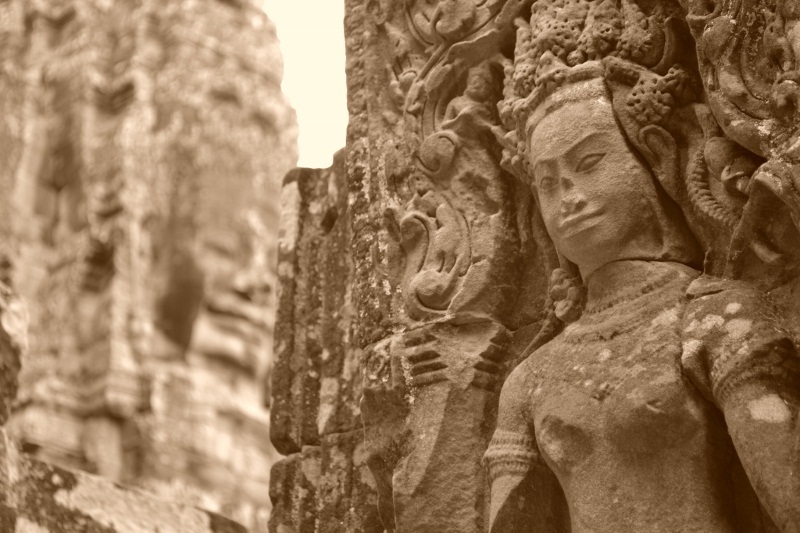 Tickets are required for entry into the Angkor Archaeological Park: 1-day, 3-day or 1-week passes are available. 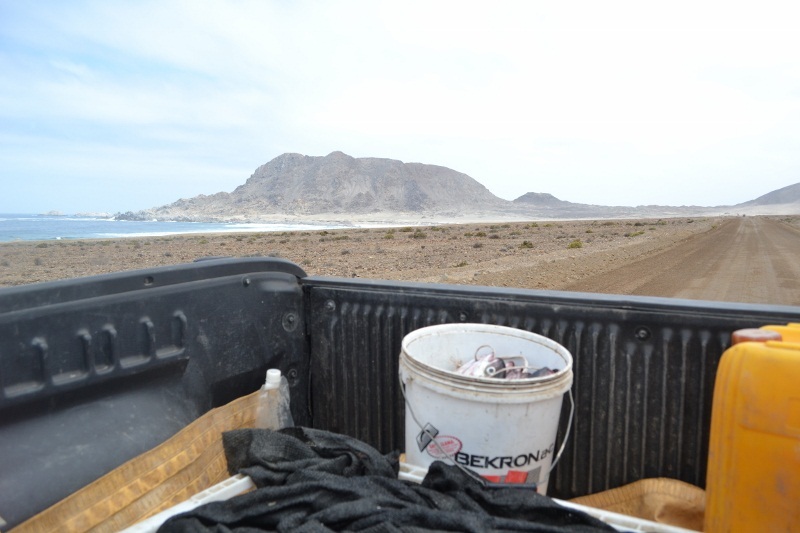 We opted for three days and made it to over 20 of the ruin sites. This amount of time was perfect for us, but if you fancy yourself an amateur archeologist, you may want to go with the 1-week pass. We started our first day early and full of energy and excitement to see Angkor Wat. We had been looking forward to visiting for many years. We found a tuk-tuk to drive us 6km north from Siem Reap to the entry point of the Angkor complex. Despite fellow travelers advising us to hire the tuk-tuk for the entire day, we decided to do things our own way (sound familiar?) and walk between the temples. Our first stop was the granddaddy of them all: Angkor Wat. From there, we set off on a trek through jungle roads and crumbling monuments. When the day was done, we had visited Angkor Wat, Prasat Kravan, Banteay Kdei, Ta Prohm, Ta Keo and Bayon. 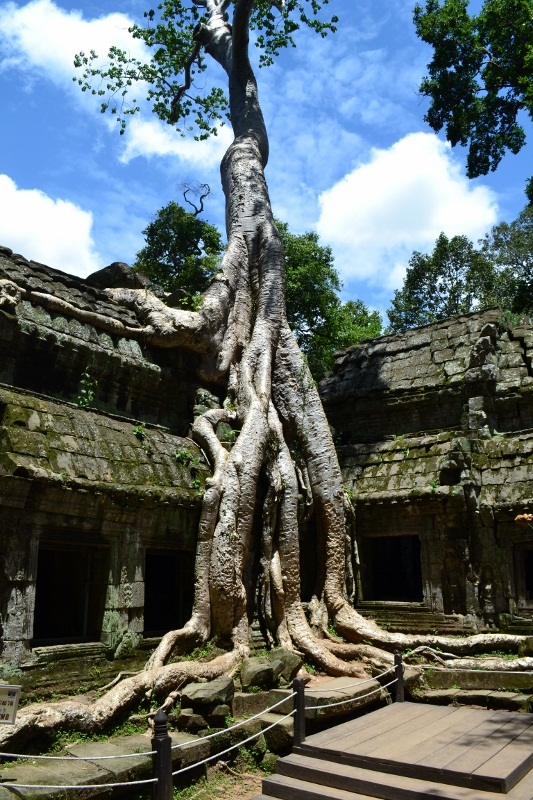 Ta Prohm is commonly referred to as “The Tree Temple” because of the numerous roots that have grown into and around the ancient ruins. Bayon is filled with massive stone faces, one of which can be seen in the background here. After a very hot, sweaty and exercise-filled day, we came to our senses and opted to hire a tuk-tuk driver for our second day. It ended up being a great decision. We were able to cover more ground and see some of the further out temples that simply would not be walkable (unless you’re a crazed exercise fanatic that gets off on speed walking marathons). Our first stop was Phnom Bakheng, a pyramidal temple atop a hill from which you can take in an aerial view of Angkor Wat (as pictured in the very first photo of this post). After viewing Angkor Wat from above, we visited Baphuon, the Royal Palace, Preah Khan, Neak Poan, Ta Som, East Mebon and Pre Rup. 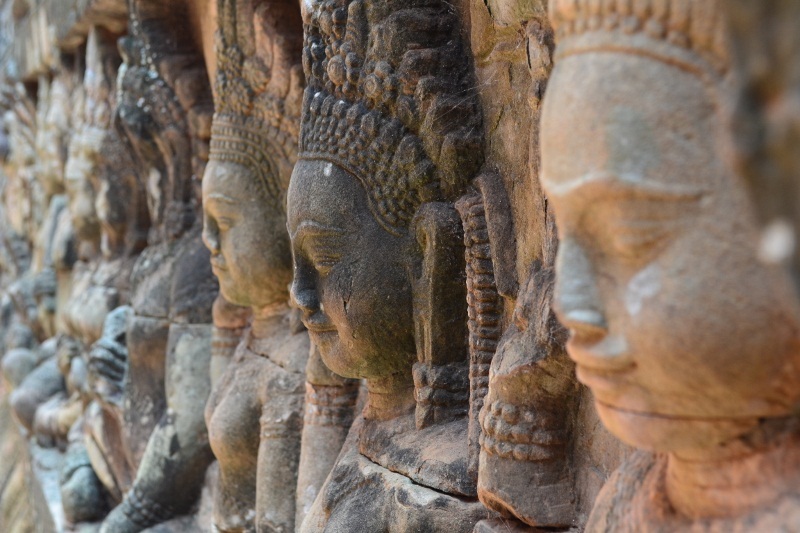 These detailed faces carved out of stone stretched on for hundreds of feet just outside of the Royal Palace within Angkor Thom. 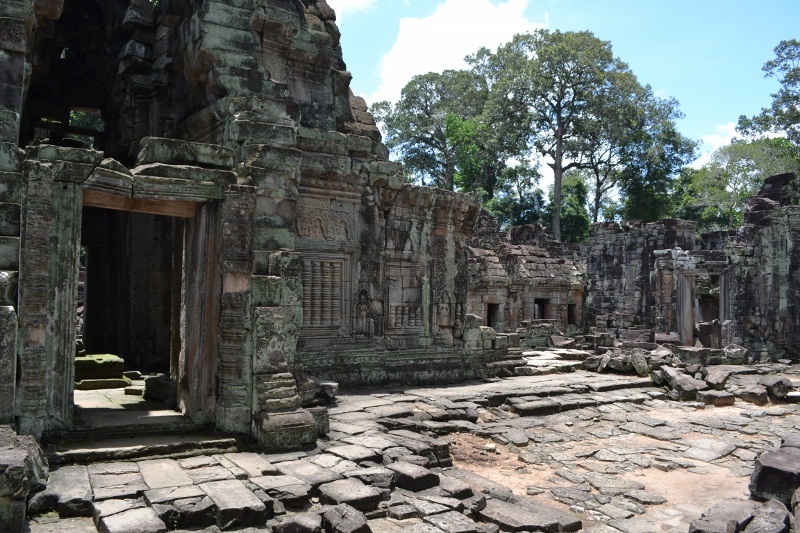 Preah Khan was one of the largest temples we visited in terms of area and also the least restored. The sheer amount of stone used to construct this building blew our minds. 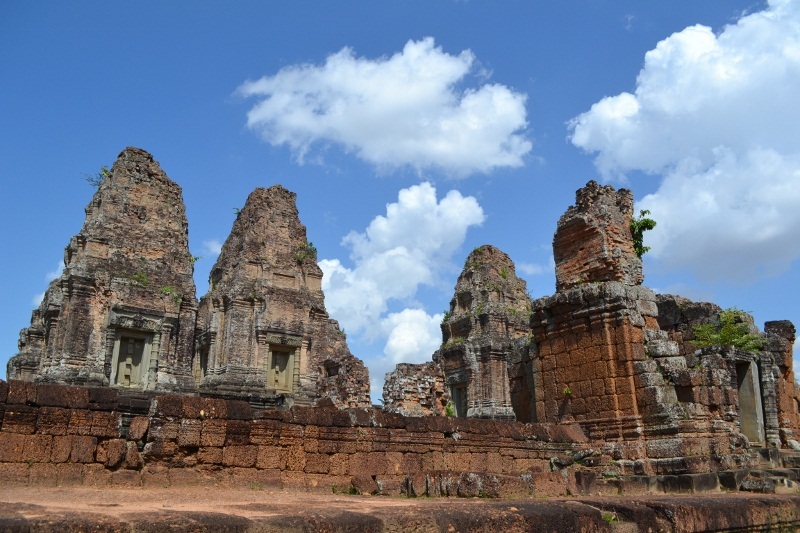 By the time we reached East Mebon in the late afternoon, we were glad that we had hired a tuk-tuk. 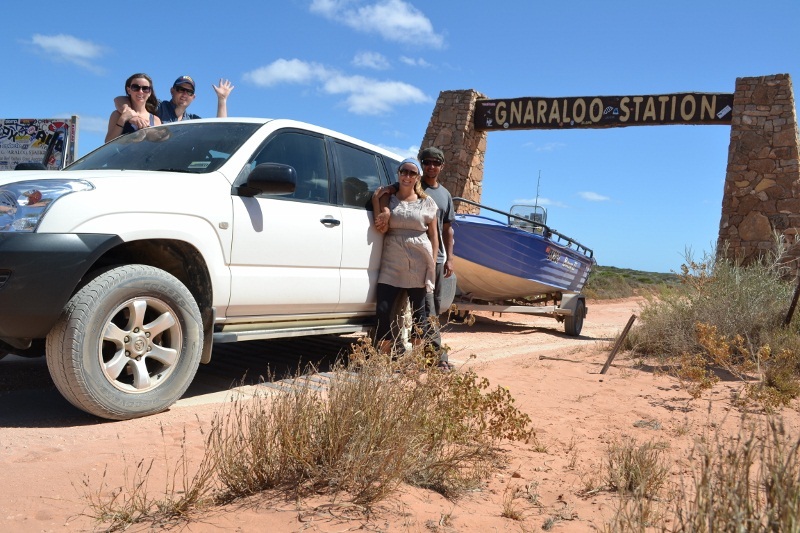 We likely would not have made it this far without a vehicle. After two days at the Angkor complex, we took a day off to relax and rest our sore mussels. At only $5 USD per hour, a massage seemed like a pretty good way to spend the afternoon. We had no idea what we were in for…we endured one of the roughest and painful, yet most effective massages we have ever experienced. Definitely one of those “hurts so good” moments. We had planned on returning to the ruins the next day, but Amy awoke to a bout of food poisoning (and all that entails) so we took another day off. The next day her situation had improved. 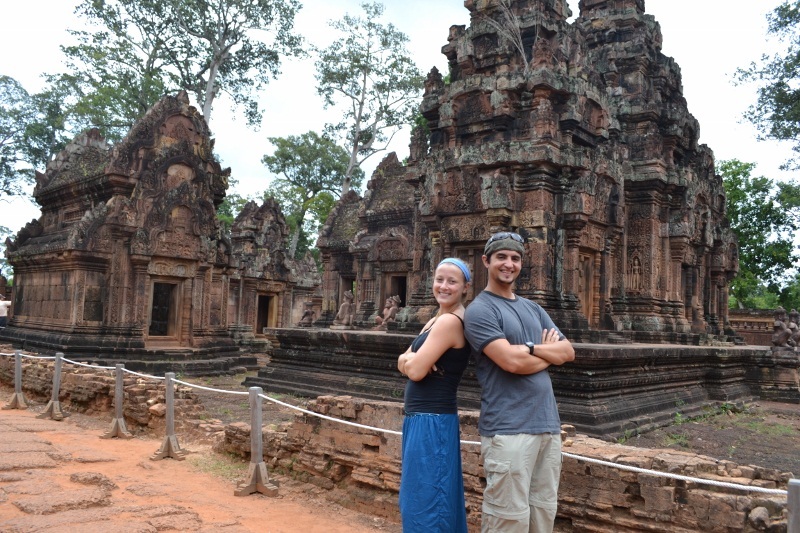 We hired a tuk-tuk once again and this time set our sights on the temples located even further away from Siem Reap. As would be expected, the more remote the temple the fewer the tourists. 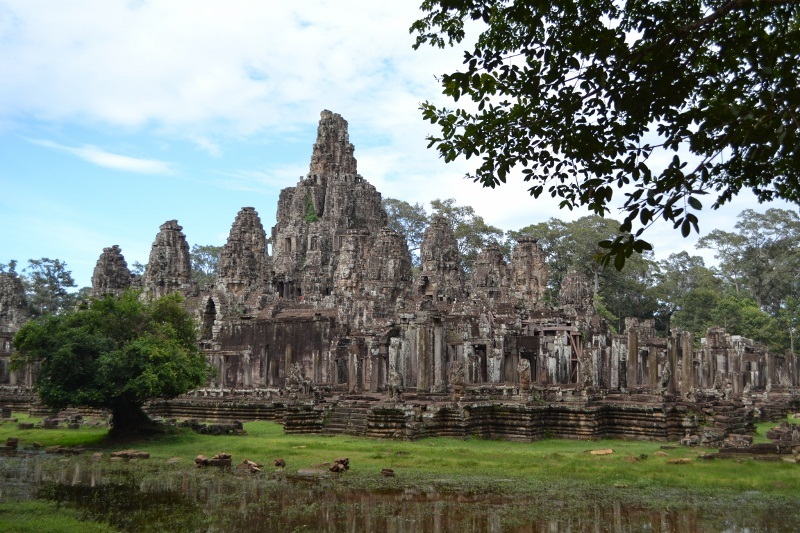 It was nice to escape the crowds as we enjoyed more of these magnificent ruins, including Banteay Srei, Banteay Samre, Preah Ko, Bakong and Lolei. 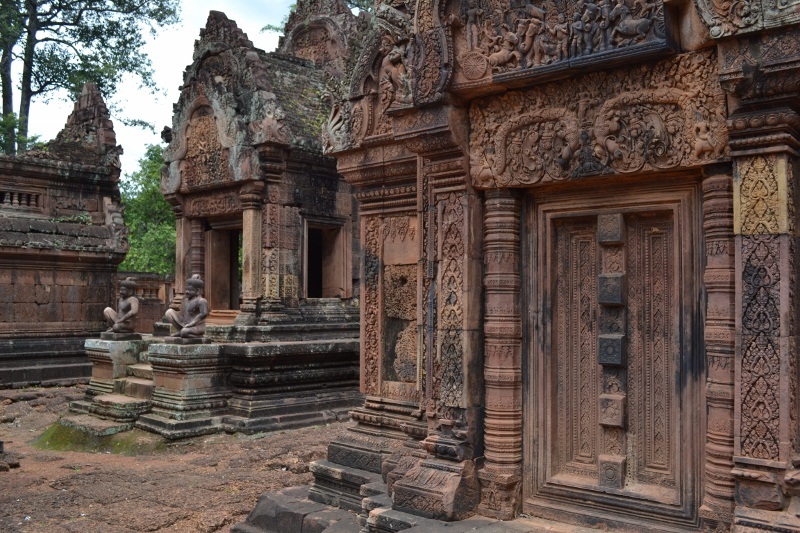 Banteay Srei is one of the furthest out temples from the heart of the Angkor complex. 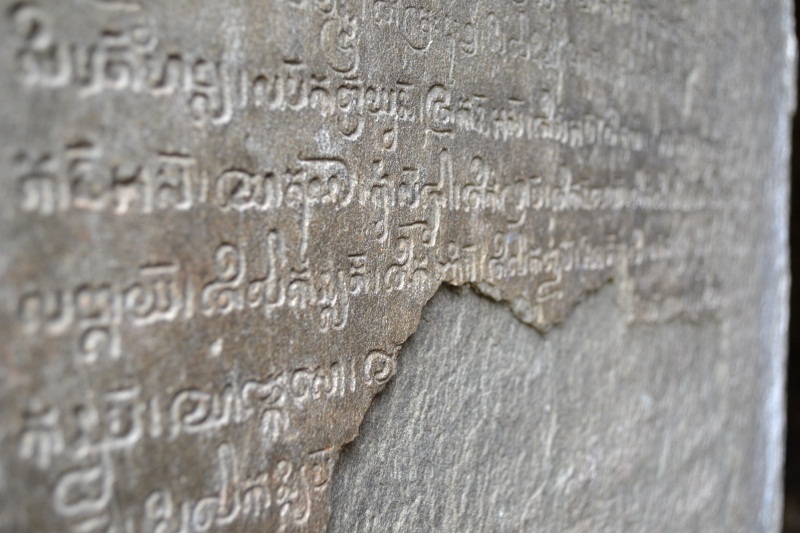 It has the most detailed stone carvings of any of the temples we visited, making it well worth the long journey. 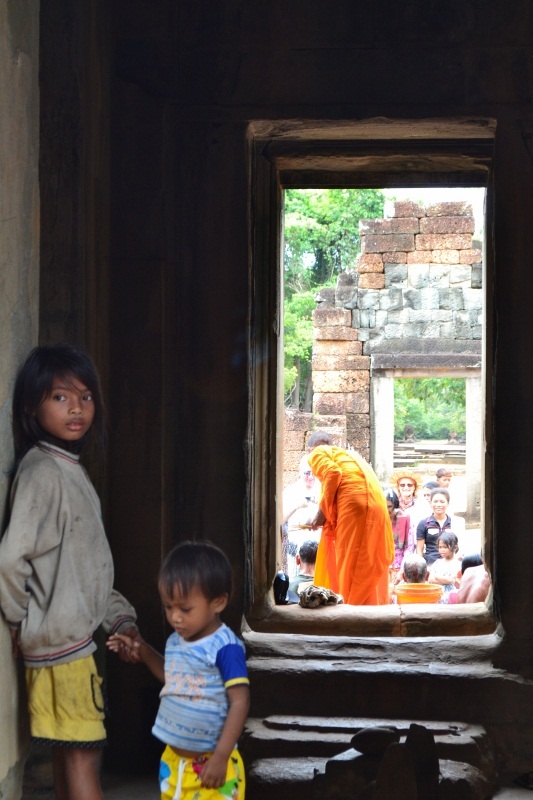 While visiting Banteay Samre, we came across a Buddhist Monk preforming a rain prayer over local villagers. 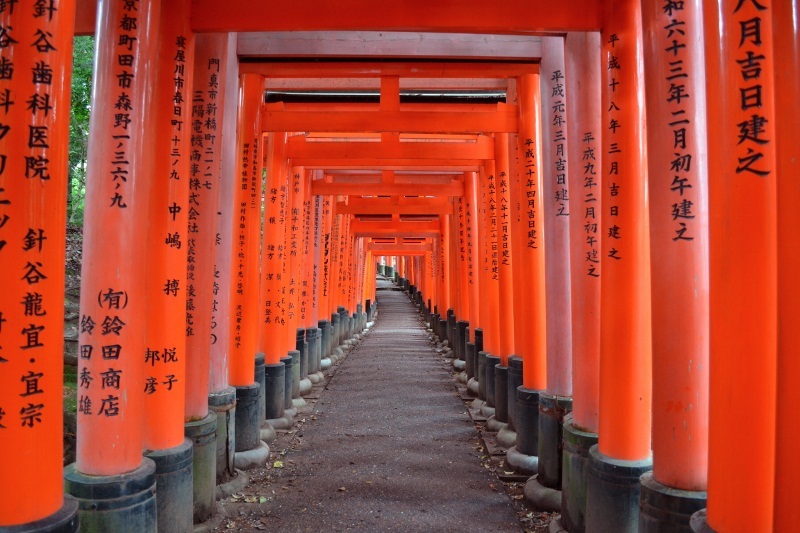 Although many of these temples are ancient, some are still used for religious ceremonies. 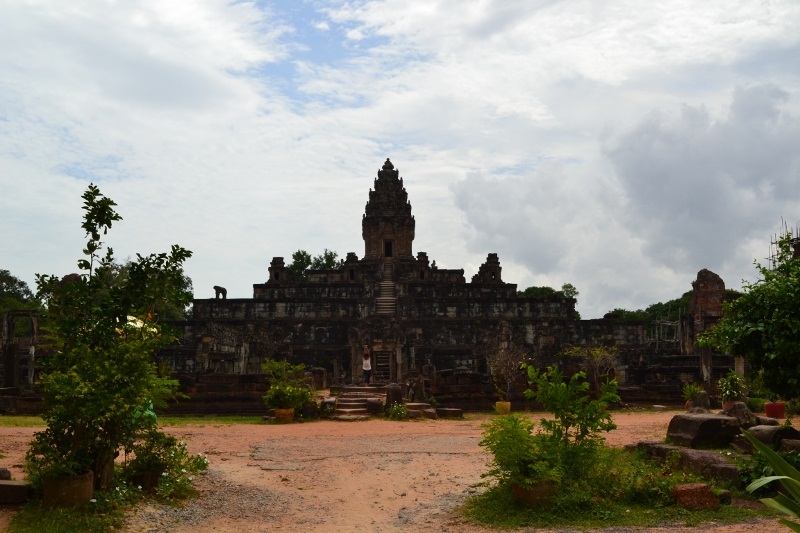 The main tower of Bakong was built to represent the mythical Mount Meru, also symbolized by the central structure of Angkor Wat. Too often during our travels we visit UNESCO World Heritage Sites that have been spoiled rather than preserved by being added to this list; many of the sites feel more like Disneyland than places of great historic and cultural relevance. This was not the case with Angkor Wat. Despite the millions of visitors annually, the temple complex retains a great deal of authenticity and truly deserves its reputation as a world wonder. To put it plainly, no matter who you are, Angkor Wat will not disappoint. 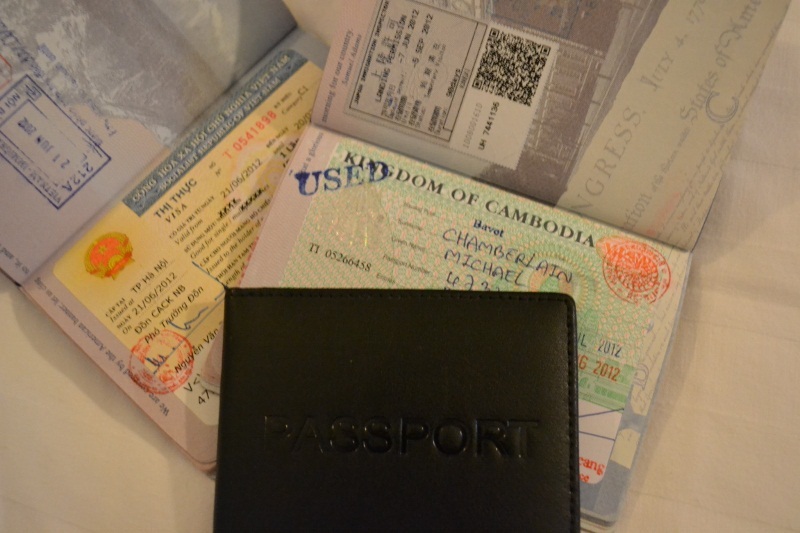 After nearly a month of traveling Vietnam from north to south, we were eager to depart Saigon and make the journey across the border into Cambodia. Land crossings in this area of the world are notorious for being unorganized and prone to inflated fees, and our crossing fit the bill exactly. We managed to pay less than others on our bus, but were still forced to fork over an “express visa fee” that went straight into immigration officials’ pockets. Gotta love land borders! Once across the border, however, all the tension faded away. Cambodia is home to large, flat expanses of sparsely populated countryside, which can really make you feel like you are in the middle of nowhere. 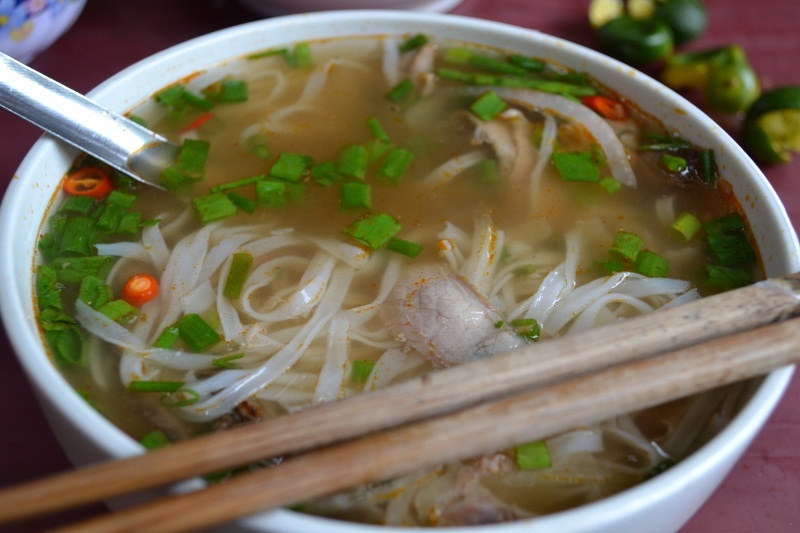 Even as we approached the capital city of Phnom Penh, it became clear that Cambodians take life a little bit slower than their Vietnamese neighbors. 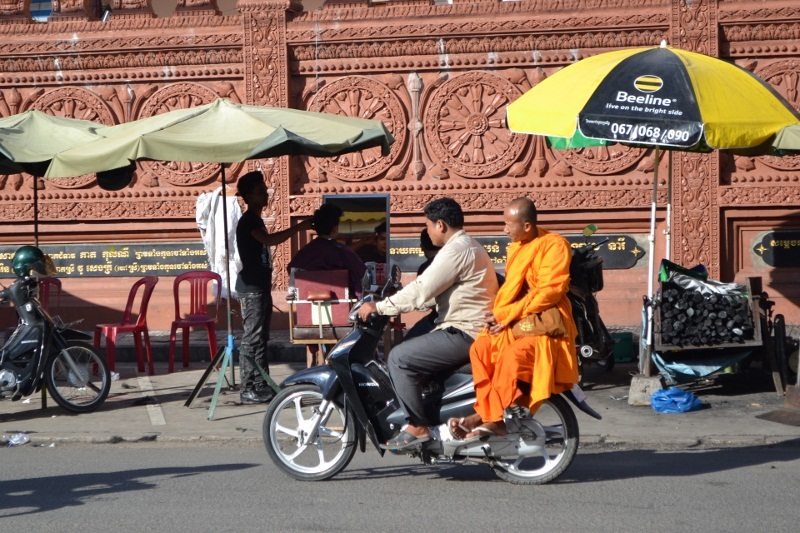 Buddhist monks stroll through the streets, the sound of car horns is much less prevalent and the locals seem to have smiles permanently glued to their faces. 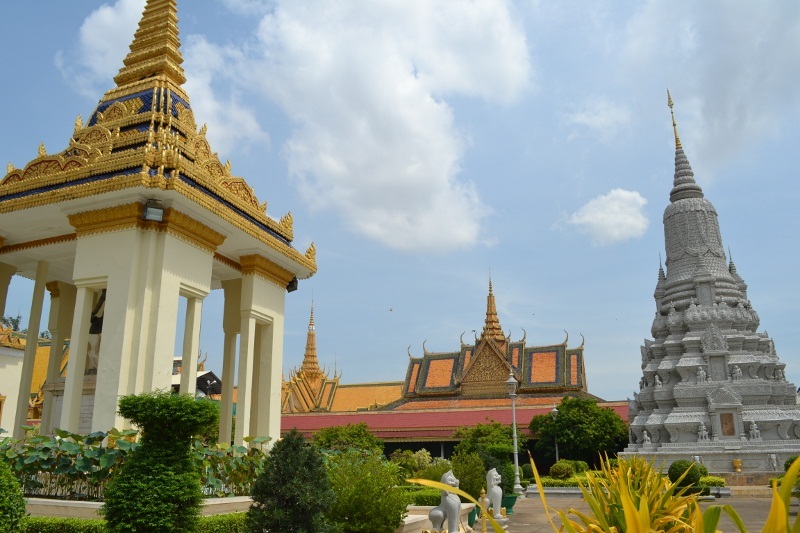 For many travelers, Phnom Penh is merely a stop-over on the way to Siem Reap and Angkor Wat. For us, spending a few days in the capital allowed us to learn more about the country’s unstable and tragic political history in the last century. We decided to make an early start one morning and set off for an all-day power tour of the city. Our first stop was the Royal Palace. 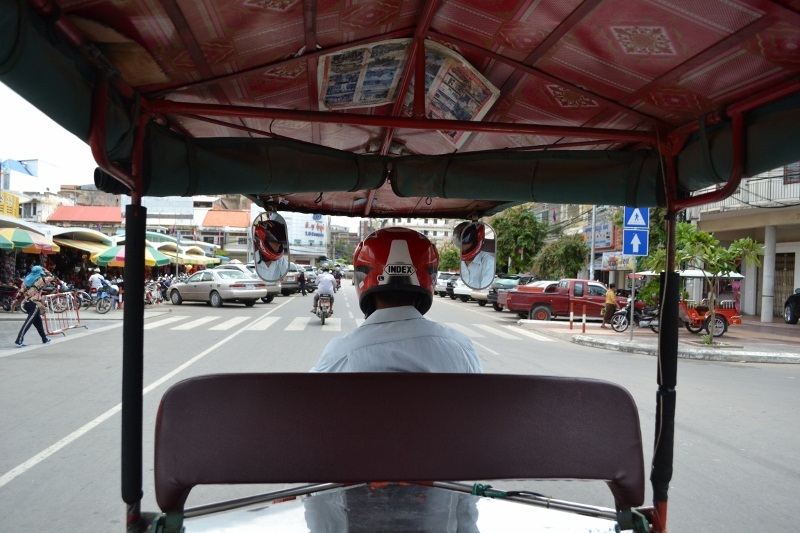 There are no official bus routes in Phnom Penh; we hopped aboard a tuk-tuk to get there. These motor carriages serve as the city’s public transit system. 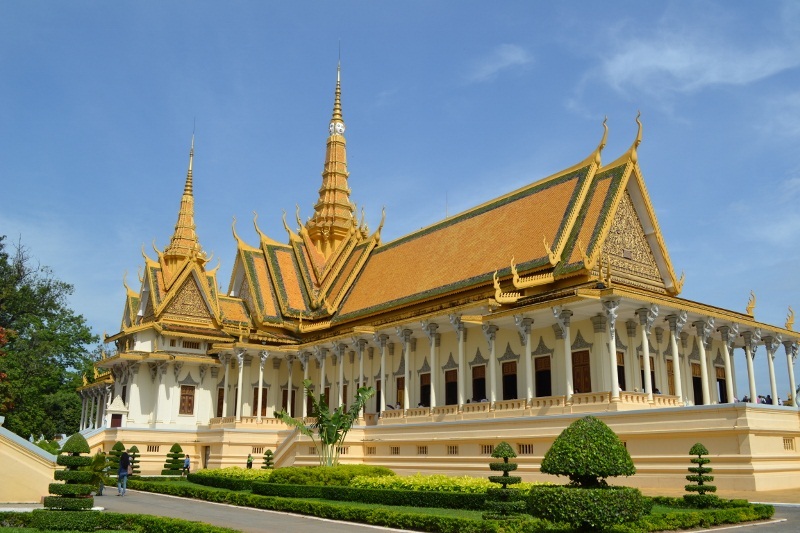 We took our time exploring the Royal Palace and admiring the colorful layered roofs and traditional Khmer architecture. 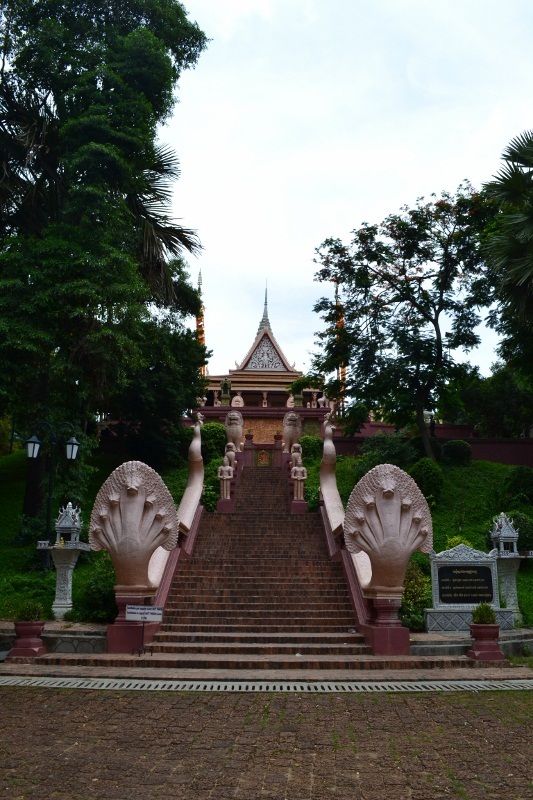 The well-manicured grounds and stunning buildings offer a glimpse back into the early 20th century, before Pol Pot and the Khmer Rouge. Following the palace we grabbed a quick bite to eat and headed back along the river to see where the city of Phnom Penh gets its name. The city existed for centuries before becoming the capital and the story goes that an old lady named Penh found four Buddha statues floating on a log during a massive flood. She had a temple built upon the tallest hill in the area to house the Buddhas. “Phnom” means hill in Khmer, and since the temple was constructed under the orders of Penh, the city became known as Phnom Penh, or Penh’s hill. After a brief stop at the Central Market, we hoped on a tuk-tuk toward Tuol Sleng Genocide Museum. 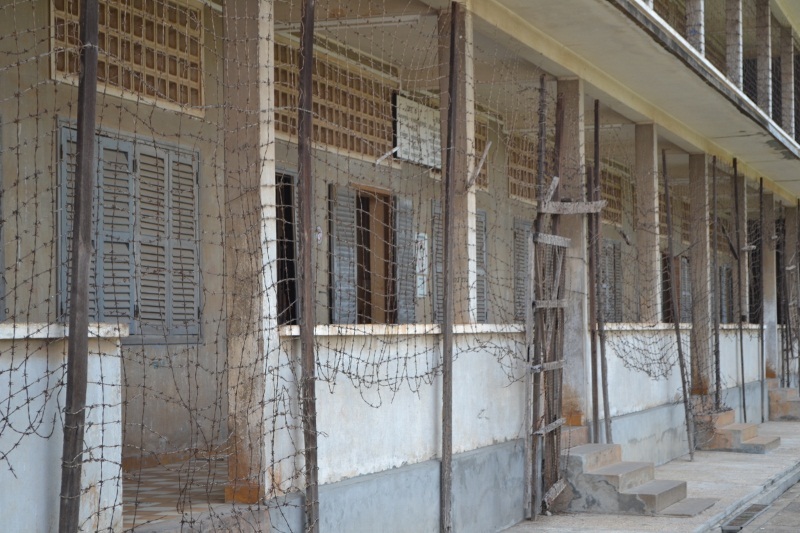 Formerly S-21 prison, and a primary school before that, the Khmer Rouge used this complex to detain, torture and execute Cambodians during their horrific reign in the 1970s. Sadly, one of Phnom Penh’s major tourist draws is an area outside the city known as “The Killing Fields.” This area contains the largest mass graves from the Khmer Rouge era. Despite frequent offers from tuk-tuk drivers to take us there, we made a conscious choice not to visit. By the end of the day, we felt that we had received a pretty good crash course in recent Cambodian history. We had come to Phnom Penh with a brief background after reading First They Killed my Father, but touring the city made what we had learned that much more impactful. As though in line with our somber afternoon, a wall of rain poured down from the skies that evening. The next day we awoke to a sunny morning and prepared to explore a brighter time in Cambodia’s history, the age of the Angkor people. Despite the seven hour ride ahead of us, we happily boarded our bus and took off for Siem Reap.